Date: Sunday, 1 February. Venue: University of Phoenix Stadium, Glendale, Arizona. Coverage: Commentary on BBC Radio 5 live. NFL commissioner Roger Goodell says staging American Football in London has gone "better than we ever dreamed". Three regular season games are held at Wembley Stadium each Autumn and the move has proved successful. 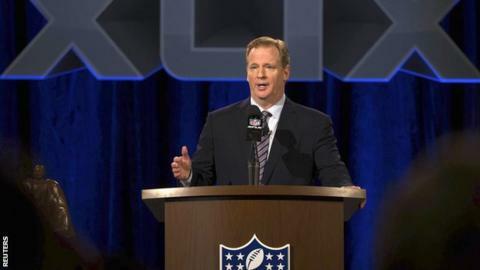 Speaking at his pre-Super Bowl 'State of the League' address, Goodell evaded questions about a franchise being created in London. But he said: "London has done not only everything that we expected but more than we expected." Goodell added: "We don't know where it will go but I think there's great potential in London for the NFL." In his annual address, Goodell also spoke of how domestic violence and cheating allegations had made it a "tough" season for the sport. The recent "deflate-gate" scandal - in which under-inflated balls were found to be used in the game that took New England Patriots to the Super Bowl final - has overshadowed some of the build-up to Sunday's showpiece game. The matter is still under investigation and Goodell said he would be making "no judgements" that could compromise the enquiries. He continued: "We take seriously anything that potentially impacts the integrity of the game. We are focusing principally on two questions - why were some footballs used in the game not in compliance with the rules, and was this the result of deliberate actions?" The sport's chief went on to admit it had been a challenging season, one in which the League came in for criticism for how it handled a series of assaults involving high-profile players: "It has been a tough year," Goodell admitted. "We, obviously, as an organisation have gone through adversity but it's an opportunity for us, for our organisation, to get better."